NEW OSHA FIXED LADDER SAFETY REQUIREMENT – EFFECTIVE ON OR AFTER NOVEMBER 19, 2018 This deadline requires that any Fixed Ladder installed on, or after November 19, 2018 that extend more than 24 feet (7.3 m) above a lower level, be equipped with a PERSONAL FALL ARREST SYSTEM or a LADDER SAFETY SYSTEM. See OSHA Subpart D – Walking, Working Surfaces 1910.21 for more information. 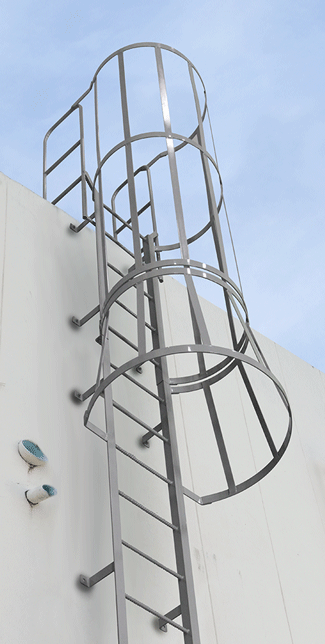 Cotterman® Fixed Steel Ladders are designed for use where safe, solid vertical climbing access is required. Series F and Series M modular fixed steel ladders are available with and without walk-thru handrails at the top landing surface. All Cotterman® fixed ladders meet applicable OSHA and ANSI standards. SERIES F FIXED LADDERS: Ladders are heavy duty welded assemblies. SERIES M MODULAR FIXED LADDERS: Ladders are heavy duty sub-assemblies, no section is greater than 7′ in length. FIXED LADDERS WITH WALK-THRU HANDRAILS: Ladders are designed for applications where safe landing access is required. They are one-piece welded assemblies for use in applications less than 20′ in vertical height. Side members are 1/4″x2″x2″ steel angle. 3/4″ corrugated steel round climbing rungs on 12″ centers. Stand-off mounting brackets are 7″. Walk-thru handrails extend 42″ above landing surface. Mounting brackets included. FIXED LADDERS WITH SAFETY CAGES: Standard fixed steel ladders are combined with safety cage protection. Available in 10′ through 29′ sizes and ideal for hatchway or side-step landing access. Cages have flared bottom opening for easy entry. Cage begins 7′ from bottom of ladder. FIXED LADDER WITH WALK-THRU HANDRAILS AND SAFETY CAGES: Designed for safe landing access and available from 10′ to 29′. Cages and walk-thru handrails extend 42″ above landing surface. SELF-CLOSING SAFETY GATES FOR FIXED LADDERS WITH WALK-THROUGH HANDRAILS Any guardrail system with a personnel opening can be protected to OSHA standard with a Cotterman® Self-Closing Safety Gate. Our adjustable Safety Gates meet or exceed OSHA 1910 Subpart D and ANSI A1264.1-2017. Hot-Dip Galvanized finish or Stainless Steel construction can be quoted. SHIPPING NOTE: All 15 thru 28 rung Series “F” models with cages ship in 2 sections. All 29 and 30 rung models ship in 3 sections. SHIPPING NOTE: All 15 thru 25 rung Series “F” models with cages and walk-thru handrails ship in 2 sections. All 26 thru 30 rung models ship in 3 sections.